A look at the locations in Ian Fleming’s fifth 007 novel. By the time we finally meet James Bond in From Russia, With Love he’s bored with “the soft life”. He’s at home at his flat off the King’s Road and dreading the thought of another day at headquarters as he finishes his breakfast. But luckily for Bond – and for the reader – something has come up and 007’s spirits are raised from the doldrums. 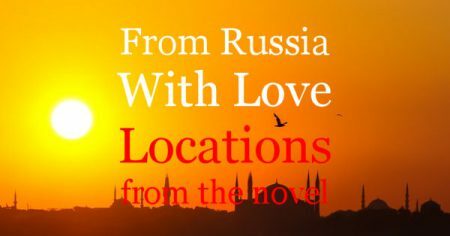 Not only is he sent to Istanbul on a mission but when he gets there a beautiful Russian cipher clerk will arrange a rendezvous with him. Bond flies from London Airport to Istanbul on a BEA flight via Rome Ciampini and Athens airports. While Ciampini airport still functions today, Ellinikon Airport closed in 2001 when a new international airport was built to serve Athens for the Greek Olympics. It had been in operation since opening in 1938. He finally sets foot in Turkey at Yesilkoy Airport “an hour’s drive from Istanbul” and is delivered to his hotel in a Rolls Royce. Today the airport is still in use, although it is now known as Istanbul Atatürk. Bond stays at the Kristal Palas hotel in “the heights of Pera”. The Pera district is now known as Beyoğlu, on the European side of the Bosporus, but the hotel is fictional. Fleming tells us Bond chose it “because its name had amused him and because he had wanted to get away from the soft life of big hotel”. It’s far from luxurious and when he arrives he almost decides to change, noting the “fly-blown palms in copper pots” in the entrance hall and “the floor and walls of discoloured Moorish tiles”. And when he turns on the hot tap the water is brown when it eventually arrives. But that’s only after a centipede is ejected into the basin. The hotel name may be inspired by the Pera Palas hotel although, built for Orient Express passengers, that was altogether grander. But the next morning he enjoys the views of the Golden Horn and the Bosporus from his hotel room, and finds the breakfast delicious. Picked up to meet the local station chief, Darko Kerim, Bond is driven through Taksim square and down Istiklal towards the Galeta Bridge. Fleming mistakenly writes that the car took 007 “out of Asia”, but Bond never crosses the Bosporus and remains in Europe throughout the novel. The Galeta bridge crosses the Golden Horn. Kerim’s warehouse is “down a narrow cobbled street parallel with the waterfront” after a right turn off the bridge. The precise location is unclear but today the area is parkland, redeveloped since Fleming visited the city. Later, after returning to his hotel, Bond meets Kerim for lunch at the Spice Bazaar. Kerim’s warehouse would have been located somewhere near the docks in Eminönü. The area has since been redeveloped. Licensed from Salt Research under CC BY-NC-ND 3.0. After returning to the local HQ, Kerim takes Bond into a tunnel beneath the city to spy upon the Russians through a periscope. The tunnel was built to drain the Hall of Pillars (Basilica Cistern), a massive underground reservoir built to provide drinking water in the event of the city falling under siege. 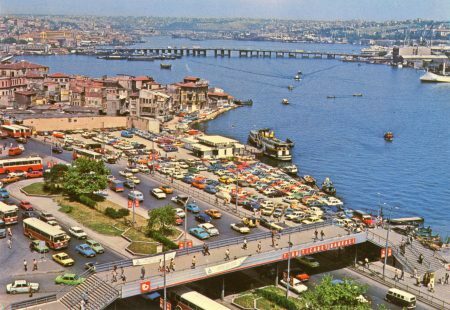 Kerim tells Bond the tunnel goes “straight down the hill – under the Street of Books where the Russians have their place, and out into the Golden Horn, by the Galata Bridge, twenty yards away from my warehouse”. The Street of Books is probably Çadırcılar Caddesi where you’ll find the book bazaar (Sahaflar Çarşısı). In reality the Russian Consulate is actually on the Beyoğlu (Pera) side. Later the same evening they go to the gypsy camp on the outskirts of Istanbul. Fleming tells us that they drive “up the far hill through the poorer quarters above the Golden Horn” and after half an hour “they stopped half way up a long hill on the outskirts of Istanbul”. That could be just about anywhere. Later Kerim decides to go after Krilencu, leader of the Bulgarian gang that tries to kill Kerim. They drive “under the ruined Aqueduct and across the Ataturk Boulevard and north of the barred entrances to the Grand Bazaar. At the Column of Constantine the car turned right”. They finally arrive in “a long ornamental square in which three stone columns fired themselves like a battery of space-rockets”. 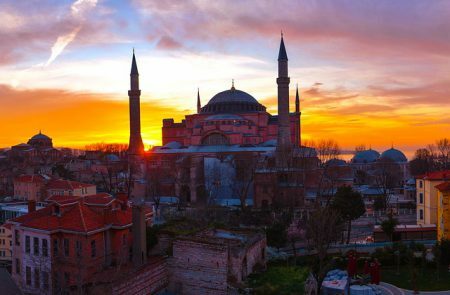 From that description it is probably Sultanahmet Square. Leaving the car behind, they continue downhill on foot towards the lighthouse, turn right down a cobbled ally and then right again along a boulevard sloping towards the Sea of Marmara. After ten minutes they come to the end of the boulevard near the railway track. Ahead of them is a shack fronted by an advertising hording with a giant poster of Marilyn Monroe advertising Niagara. Again, it’s not clear where this is. Bond returns to his hotel to find he has a guest. Lying in his bed, naked except for a velvet ribbon and silk stockings, is Tatiana Romanova, the Russian cipher clerk. Before settling down for a night of passion she insists on they leave Istanbul on the Orient Express the following evening. 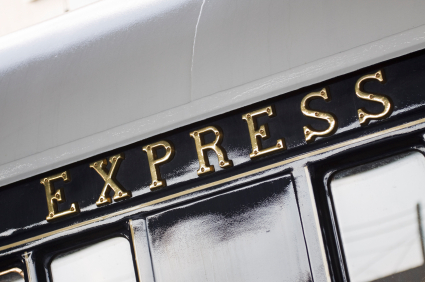 Probably the sign should have read SIMPLON ORIENT EXPRESS. Before they even cross the border into Greece, Kerim identifies three Soviet agents aboard the train. Two of the MGB agents are removed from the train at the frontier but Kerim tells Bond he should “slip off the train at Salonica – with the machine”. Bond has already decided to remain on the train and “play the game out and see what it was all about”. They remain on the train after the stop at Thessaloniki, also referred to as Salonica. Later that night, after Idomeni station at the border, Bond learns from the conductor Kerim is dead. Going to Kerim’s compartment Bond finds the bodies of both Turk and the remaining Russians. Each had stabbed the other to death. At Belgrade there is an eight hour wait while another section of train arrives from the route through Bulgaria. One of Kerim’s sons, Tempo, meets Bond and Tatiana on the train and drives them to his flat. They to the station in time for the nine o’clock departure. In their compartment Bond stays awake, noticing as they pass through Vincovci, Zagreb and Ljubliana. At the time all where in Yugoslavia. Bond starts to relax as they approach the west and manages to sleep until they get to Sezana. And then they are across the border into Italy with “the first smell of the soft life”. At Trieste station Bond really starts to believe that the danger is behind them. Joining the train at Trieste is Captain Nash, apparently a local secret service man. The girl declines Bond’s suggestion to see Venice. Instead they go to bed and “as the train jolted over the points into the echoing station of Venice, there came the final lost despairing cry”. After Venice the train passes through Padua and Vicenza and they watch the sun set over Verona. Later Nash tells Bond of his true identity and reveals their planned fate in the Simplon tunnel. Fleming was likely inspired by the death of US naval attaché Eugene Karpe in 1950. He fell – or was thrown – from the Orient Express near Salzburg. Built to provide a shortcut between the Swiss town of Brig with Domodossola in Italy under the Simplon Pass, the Simplon Tunnel is a 20 km rail tunnel dating from 1906. 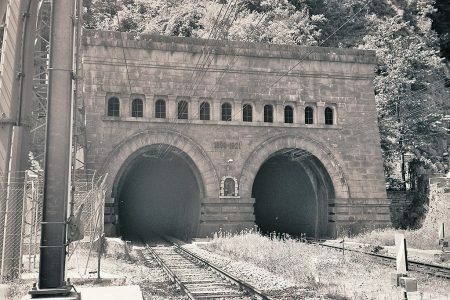 A second parallel tunnel opened in 1921. The southern entrance to the Simplon Tunnel. Photo by Markus Schweiss. Licensed under CC BY-SA 3.0. Bond kills the man he now knows to be Donald Grant and so Bond and Tatiana survive the tunnel. The train continues past Lausanne and crosses into France at Vallorbe. Rather than continue all the way to Paris Bond and Tatiana alight from the train at Dijon. Following Grant’s plan to drive the 400 or so kilometres to Paris they first go to British Embassy in Paris. Bond arrives at the Ritz by taxi where he has a couple of drinks at the bar. Then he heads up to room 204 for Nash’s prearranged midday rendezvous with Rosa Klebb.